Today my son had his last day at school – holiday time! We had little hope he would pass his semi-final year at the “middelbare school” but he managed to pull of a small miracle and passed anyway. Yay! His dad will sleep better now… and I used the relaxed mood to sit behind this computer and write a blog post about the July release of KDE 5 for Slackware-current. While my son went out to party, we slackers just install the latest and greatest software and pound it hard to see if any bugs seep out of the cracks. The past month saw various KDE component releases which I let slip, because I intend to offer upgrades only when newer versions of all of Frameworks, Plasma and Applications are available. Well, there was Frameworks 5.11.0 several weeks ago but I skipped that one entirely, and today Frameworks 5.12.0 was released. The KDE Applications 15.04.3 release was already more than a week ago, and Plasma 5.3.2 one day before that, on 30 June. Time for some package building, and because the Frameworks sourcecode was made available to packagers a number of days ago, I had them ready on wednesday… but needed to wait for the public release of the new Frameworks. Now then, my July release of the next-gen KDE for slackware-current: KDE 5_15.07. Its main components, as said earlier, are Frameworks 5.12.0, Plasma 5.3.2 and Applications 15.04.3. The updates to Applications also contain the usual KDE 4 Long Term Support (LTS) updates for kdelibs, kdepimlibs, kdepim, kdepim-runtime and kde-workplace. Hopefully Pat will fold those LTS releases back into the official KDE 4 for Slackware-current. What’s new in KDE 5_15.07? Well… probably all sorts of improvements under the hood of the various packages, but nothing exciting jumps out that I feel compelled to tell you about. Overall, more stability and less bugs, let’s hope. Read the Release Notes and you’ll know it all. Hey, weekend ahead! Time is on your side. As always, the accompanying README file contains full installation & upgrade instructions. Note that the packages are available in several subdirectories below “kde”, instead of directly in “kde”. This makes it easier for me to do partial updates of packages. The subdirectories are “kde4”, “kde4-extragear”, “frameworks” “plasma”, “plasma-extra” and “applications”. Upgrading to this KDE 5 is not difficult this time, especially if you already are running KDE 5_15.04 or later. You will have to remove old KDE 4 packages manually. If you do not have KDE 4 installed at all, you will have to install some of Slackware’s own KDE 4 packages manually. Posted: 10 July, 2015 in Slackware, Software. Any idea what has gone wrong and how to fix it? I guess you did not run “xwmconfig” to select “plasma” as the graphical environment. If you just “startx” then Slackware will still try to start the default KDE 4 but you no longer have a functional KDE 4 on your computer. It is still as ugly as week old pizza, but I’ve change what can be changed to improve its appearance. 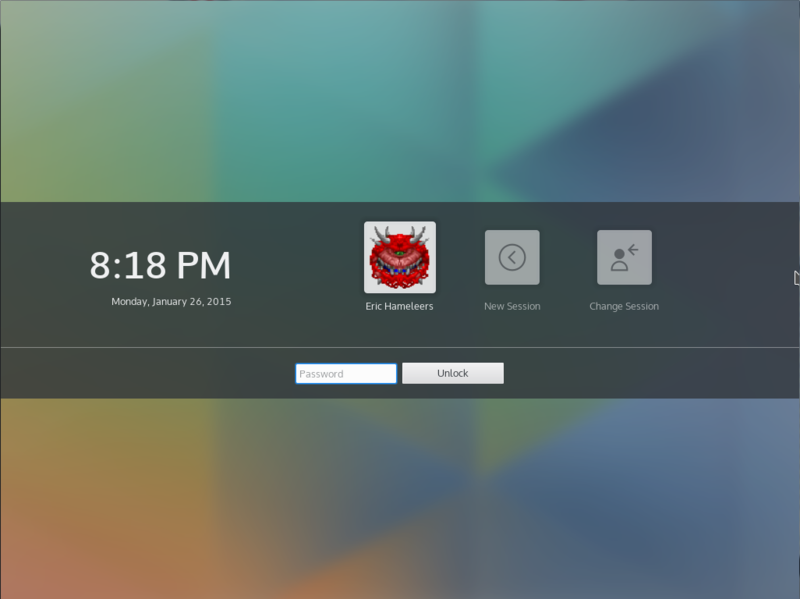 There are still some rough edges, but, overall, an improvement on KDE 4. At the moment I’m sitting a good 7 feet away from the monitor and the image is sharp as a tack. That is the first thing I noticed, the sharpness of the screen. Some icons won’t appear on the task bar. Applications icons cannot be placed on the task bar, nor on the desktop. There is no quickl aunch for the task bar. The icon for the trash can on the desktop was HUGE and I couldn’t find a way to make it any smaller, i.e.,, the usual settings for icons don’t work. Glad you like it better this time. No worries… it will take a year or more before Plasma 5 will hit Slackware. Application quick launch icons on the task bar: while the application is running, right-click on its task bar icon and select “Show a Launcher When Not Running”. No application icons on the desktop: unlock the widgets, right-click on the desktop background, select “Desktop Settings” and select “Folder View” instead of “Desktop” as the layout. Then right-click the desktop again, select “Folder View Settings”, go to Icons and select a smaller icon size. Upgraded here with no issues. Thank you Eric! Many thanks for the tips and hints. Well…. ran KDE 5 for just about two days and while it has definitely improved, “under the hood,” it is still just a bit “too rough around edges” for my daily purposes and I’ve re-installed 4.14.3 from -current. I’ll give it another try in six months time and see how it has improved. Eric, thanks, again, for all the “heavy lifting” you do for the Slackware project. I’ve also tried reinstalling all the KDE 5_15.07 stuff, with same results. You’ll have to do your own troubleshooting first. Has it never worked, or did it work before but stopped after the last upgrade? Is your sddm user part of the “video” group? Is there anything in the X.Org log that explains more about your crash? Congrats to your son! Sounds like one of my nieces. She’s really bright, but not that into school. Since a sddm dev has contacted me about the issue that I have been having with the shutdown countdown timer going past 0 into negative numbers, I have set up -current/KDE5 on a PC again to help debug and I can’t even get into the sddm settings in system settings. Once I click on “Login Screen (SDDM)” System Settings locks up and I have to close it. I am guessing that this is a KDE dev problem, just wanted to note it here and see if anyone else has this issue. Hi Ed I have the same problem as you with the countdown going negative but unlike you I can change SDDM themes successfully. With all the other themes nothing happens when shutdown or reboot is selected, but no countdown timer. Thanks Eric for your effort in supplying the latest updates of KDE5. Things are looking more solid at the mo’ but not quite ready for main stream use just yet. Hello how are you? I’m trying to update my kde, made many package updates, however when I enter the kde returns this error, already updated all xcb packages, I am a long time wanting to use the kde5, wait … thank you. I’m sorry I forgot the link. I fix… The slackpkg not want to install libxcb, I installed manually and it worked … thank you, and sorry for the inconvenience. If someone could manage to give a help, would much appreciate! I get “kstartupconfig4 does not exist” when trying to start KDE5. I have no idea why this error still persist. Hello, I’ve a strange problem: energy engagement is gone. No way to set monitor sleeping time, screensaver or standby timer. And my fans are at high speed all the time! I think that cpu power is at the maximum all the time my pc it’s working, even without do nothing. have you some advice? Thanks in advance. Tonus, I do not think that you have installed slackware-current. alexsson – this is a testing ground for KDE 5 on Slackware-current which is a testing ground in itself. I expect you to do some more troubleshoooting yourself. You are providing no useful information. Fabio is your user a member of the “power” group? Do you have all packages installed? alienbob yes, i’m in that group and think that i’ve all the packages installed. I’m in current and for long time i’ve used your KDE packages. After the latest release of 4.x now i’ve installed the 5.x branch step by step by your guide. I’ve checked two times the packages and dependences. But the strange thing is that this problem with energy saving control is present from 4.x branch. It’s occur on my PC with slackware current at 32 bit and KDE5, and on my notebook with slackware current at 64 bit and KDE4. Both of them are with you ktown packages. I need some advise. I have installed Slackware current twice in a row in the last two days. I upgraded KDE 4 to KDE 5 following you instructions. Basically it works if I start from init 3 with startx. Though when I switch to init 4 the user name filed is missing from the sddm login screen. I have added the section to rc.4, checked sddm library at var/lib/sddm, plasma is selected with xwmconfig, reboot button is working on sddm screen, too. Just the user cannot enter the user name because ther is onyl a password field appears. Do you have some tip what to check? When you install my sddm package, the doinst.sh script changes the default theme which is configured in “/etc/sddm.conf”, to KDE’s “breeze” theme. The breeze theme does not show a username entry field, you will have to click on one of the user avatar icons to select that user and enter the password. If you do want a username entry field you will have to configure a different theme for sddm. Open /etc/sddm.conf in an editor and look for the [Theme] section. Thank you for the tips. I followed your advise. Changed the theme to a different one and that worked. I was able to start a desktop session with elarun theme from init 4. The real issue is that breeze theme has no icon to be clicked. After I tried elarun theme I switched back to breeze but the issue reamined the same: no icon to be clicked. I checked sddm.conf. FacesDir and ThemeDir but they seems to be ok.
Breeze theme looks great so I would really prefer that to use. It seems that I have problem with sddm whenever I select themes where icons needs to be clicked rather typing user names. The same issue happenes when maui themes is applied. There are no icons to be clicked. I solved the mistery. sddm.conf contains a row MinimumUid. It was set to 1000 by default. I assigned Uids from 200. (I am not experienced yet in linux user management but 200 seemd to be a reasonable amount to start with) I changed MinimumUid 200 and switch to sddm. Voila! All icons appeared. Thanks for your patience and sorry for writing too much about this. Well at least the whole issue – including the solution – is documented in one place now, and Google will find it soon. Hi I love this KDE, but I am having some issues. I have to restart x approximately every 3 days, because it gets stuck. After 2 days it starts to run slightly slower and eventually gets frozen while I am switching between workspaces so I can get neither keyboard, nor mouse response. I go to tty1, and there are no strange messages in there but after that it refuses to return to tty7(where the x session should be). Going to any other tty is no problem though. Error org.freedesktop.DBus.Error.NoReply: Did not receive a reply. Possible causes include: the remote application did not send a reply, the message bus security policy blocked the reply, the reply timeout expired, or the network connection was broken. In comparison pm-hibernate is even slower. I tend to keep a lot of tabs open in firefox(150-200). I noticed that when I shut down firefox before hibernation, wake up is normal. I did not have this issue in kde4, though. Will be very grateful if you have any suggestions how to fix this. I package Plasma 5 together for you to test, and I know a lot of how it all works but not in the detail your require. In such cases, it is best to open a bug in KDE’s bugtracker and explain your issue. It will get proper attention there. There’s nothing in the logfiles that points to reasons this sluggishness and your resume issues? Files in /var/log , your ~/.xession-errors and such. Just finished the install of KDE5. Pretty awesome. No issues at all. I really help to read the reading list. One thing I noted. I installed your trayer-sg package. Log out and logged back without making the desktop file. I live dangerously 😉 The HP tray icon that was complaining before is placed just fine to the left of the Show Hidden icons on the panel. I play around without the desktop file for a while to see what happens. This was from a clean install in VirtualBox. Need step add my non-slack programs to the mix.